We often hear discussion about diversity in the various areas of everyday existence. Mass media attempts to explain the contradictions or distinctive characteristics of age groups, genders, nationalities, religions and political ideologies that separate and/or connect each of us. Depending upon the attached news value we find ourselves wanting to understand both sides. Most often after exhaustive psychological studies and biased commentary we tend to put aside our differences and appreciate those qualities that bring us together despite political and religious pressures to stand apart. Take for instance a recent picnic at The International Peace Arch Park where Icelandic descendants from Washington, Oregon and British Columbia came to honor their nordic ancestry and found they had much more in common as fellow human beings. 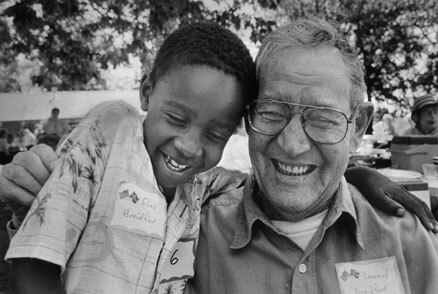 In this photograph Leonard Briedford age 88 and his adopted grandson Elias age 7 share closed eyes, wide smiles, a big embrace and an enduring love for each other. Our commonalities transcend our differences and bring us to the greater understanding of life when we see that we all belong to the family of man.